When Abby met Simon, a drink in the uni bar lead to keeping in touch, late-night phone calls and intimate catch-ups. It was the start of something special, a love Abby believed would last a lifetime. A wedding, two daughters and fifteen years later, Abby's world is falling apart. Having discovered Simon has had an affair, her normally ordered mind is spiralling out of control. Crushed by the betrayal and shocked by her own reaction, she knows she needs to get herself together; she's just not sure where to start. With Simon on a mission to win her back and a close friend hiding a secret that could push her further over the edge, Abby finds strength and support where she least expects it. But as she attempts to gain control of her life and make decisions about her future, it may be more than the limits of Abby's mind that are put to the test! 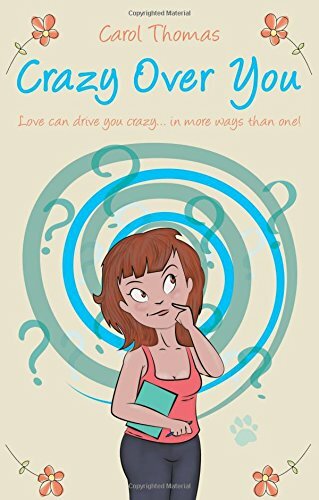 Crazy Over You is a refreshingly honest portrayal of a woman's reaction to her husband's infidelity while also being a touching story of friendship and love. It is a novel for all those who have experienced a break-up and know that living happily ever after is not quite as simple as meeting your man! From looking at the cover, you might be forgiven for thinking that this is run-of-the-mill chick lit, but Crazy Over You is a really thought-provoking book examining the effect of an affair on a marriage. Far from being all man-hating and finger pointing, it really digs deep into Abby's thoughts and feelings. Abby is understandably crushed by Simon's affair. She feels hurt, betrayed and angry so it's no wonder that she starts a harmless flirtation with her colleague, Brad the hunky PE teacher. I wasn't sure of Abby's frame of mind when flirting with Brad, was she trying to get back at Simon or simply wanting to feel attractive? Either way, Brad turns out to be a really good friend (almost with benefits) and when Simon sees Abby with Brad he gets a touch of the green-eyed monster and realises what he has lost. The book really delves into Abby's psyche and I thought it was brilliant when she vented her anger by writing a therapeutic letter to 'her'. As we all know, it takes two to tango so although Abby is angry with the other woman at first, she realises it is Simon she must forgive or forget in order to move on. I really felt her struggling with her feelings and as she flirts more with Brad I could feel her struggling as she was still in love with Simon. Abby needs to decide if her marriage is worth saving and just when she has made her decision she finds out that her friend has also been keeping a secret from her. Abby is so confused and tormented that she thinks the worst and I wondered if she could ever trust Rachel or Simon again. I'm not giving the ending away but this book is written in such a way that anything could happen and I'm sure it's an ending that will divide opinions. A very clever, deep and thought provoking story. For some reason, I didn't really warm to Abby so I can't award 5 stars, but I did enjoy the book as a whole. It's a really good debut novel from Carol Thomas and I look forward to reading more from her.